I just got home from the ultrasound appointment with the OB. It went pretty well! No bad news! And to me, no bad news is great news. :) As the RE had said during the pep talk yesterday, our goal today was to see gestational sac growth and we definitely got that. No fetal pole or yolk sac yet, but we have another appointment next Wednesday where hopefully we will get to see that. I will also have yet another beta drawn that day too. He originally asked that we do the beta on Tuesday (the day before the ultrasound) but I requested that we stop with the betas already because they are causing Kevin and I so much emotional distress. The doctor said it's good information to have, but compromised and said we could do the beta draw on the morning of ultrasound day. That way we will get the beta back after we've already done the ultrasound. This sounded SO much better to me! Those betas are killing us. I hope this approach gives us a little more peace of mind. He also agreed with the RE that there's a very slim chance that this is still ectopic, but he's much less concerned about that at this point. 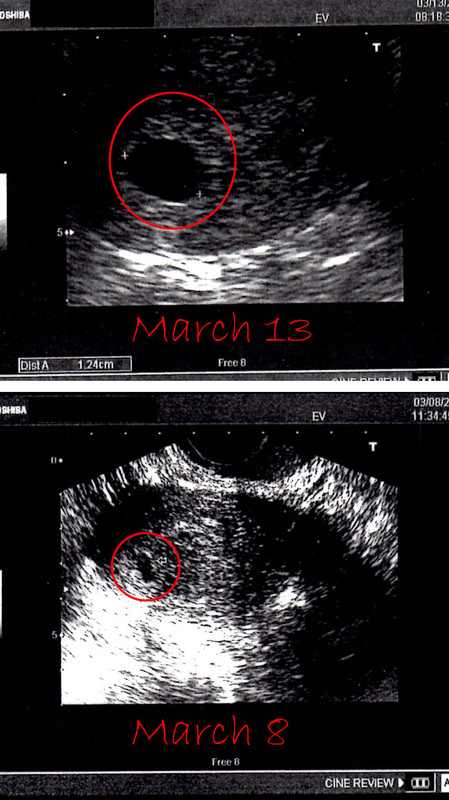 Anyway, here are the photos to compare of the two ultrasounds. The top is from today, and the bottom is from Friday. Check it out! What a difference! I had no idea so much was going on in there. We obviously were concerned that we are at the 7 week mark with no fetal pole or yolk sac yet. But the OB said that every pregnancy is different. And while we aren't out of the woods until we have a heartbeat, this is going in the right direction and he's pleased for now. I'm so happy we aren't out of the game yet and this little one is hanging on, albeit slowly! Thank you for the continued prayers. I know it's not just lip service and that you all are actually praying for us, because these prayers are making a difference. We are overwhelmed with the amount of love and support from friends, coworkers, and blog readers. Thank you from the bottom of our hearts. 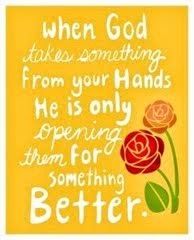 Thank you, I pray something good comes from next week's ultrasound! Thank you. I hope that everything continues to progress and we see something in there next week! What a beautiful sight! These little IVF babies are something else!!! So unpredictable and don't follow the rules, do they? Loving that you're seeing growth! Can't wait to hear more good news from your next ultrasound! Grow little one!!! I pray that there is some good news next week too. It will be very telling! hoping you keep getting these small bits of improving news!!! Thank you, I really hope that next week we have stellar news. Makes me smile after reading your news. Yay, I'm so excited and happy for you guys!! Those two pics show a tremendous difference to me!! That's so great girlie!!! What a difference a few days can make! Little baby is still growing and the beta numbers show :) Hope you guys get nothing, but good news from here on out!